Frank T. Suryan, Jr. is Chairman and Chief Executive Officer of Lyon Living. Since 1988 this privately held multi-family real estate company has acquired more than 21,000 units in California, Colorado, Florida and Georgia with assets approaching $2 billion. Lyon Living has developed more than 11,000 units and currently has over 2,000 additional residential units, 150,000 square feet of upscale retail, and a boutique hotel in its pipeline. Lyon Living continues its focus of unparalleled design, unique guest experiences and innovation. Frank’s community involvement includes a commitment to education and working with underprivileged children. He is a Board and Executive Committee member with Orangewood Foundation and is a Board member with the Boys and Girls Club of Los Angeles Harbor, where he is actively involved with their capital/endowment campaign. He is also a Board member at Mater Dei High School with a major role in the school's long-range planning and capital campaign. 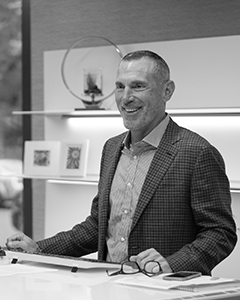 In addition to his philanthropic interests, Frank owns 14 Sonic Drive-In restaurants and continues to build the brand throughout California by developing or acquiring 2-4 stores per year; he is a board member of LinkSoul golf apparel and LinkSoul Lab that features workspaces and a gallery. His interest in fine wines prompted ownership in Foley Wines and his diversification continues with ownership in a national flooring company. Frank is a graduate of the Marshall School of Business at the University of Southern California, where he serves on the Board of Leaders. In 2009, he received the prestigious USC Leventhal School of Accounting Distinguished Alumnus Award and was inducted into the Mater Dei Ring of Honor.